Why is that the case? Because, generally speaking, most fruitcake is bad. Really bad. Most of the ingredients bear no resemblance to anything that can truly be called “fruit” or “cake”. Where does one get those fake green and red processed fruits any way? Is that something specially grown and shipped from The Wonderful World of Wonka. The word “Technicolor” comes to mind. Technicolor was fine for Dorothy and the Munchkins. But I don’t want Technicolor foods. Therein lies the problem of fruitcake: it starts with such promise. It starts with such lofty ingredients. It sends visions of spiced holiday abundance swirling through my head. Cookbooks from the late 1800’s detail fruitcakes that sound wonderful compared to the over-processed invention of today. They tell of a cake that is mostly fruit with just enough batter to hold it together. Some cakes call for upwards of 9 pounds of fruit. That sounds delicious! Alas, the fruitcake has lost its way — it has lost what it truly could be. 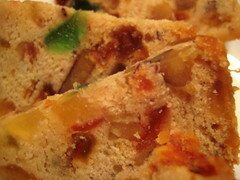 Fruitcake combines a plethora of truly great ingredients into one very poorly interpreted dish. Fresh and dried fruits are a good thing. Nuts are a good thing. Warm spices of cinnamon, nutmeg and clove — all good things. Cake — who can argue with anything that falls under the category of cake? But the result? Usually not very good at all … unless it’s done right. It needs to be done with care, from scratch. It needs to be done the Southern way. So today we consider the best of the fruitcake — not those found in boxes at the big box stores ready for mass holiday crowds. Not the one found in the box of Christmas ornaments from six years ago. Nothing using Technicolor fruits. We consider instead the fruitcake as it could be — a cake worthy of all of our holiday celebrations. To vote for Fruitcake in our Southern Sweets Showdown, visit our Facebook page or take the poll here on the site. As you vote today consider what fruitcake once was and can ideally be: a rich celebration of the earth’s many delicious gifts to us during the most celebratory of gift-giving seasons … not something that is better suited to be a bookend. Consider, for example, this cake from Alton Brown (a Real Southern Man) called Free Range Fruitcake.